Hundreds of volunteers have armed themselves with tongs and gloves to battle plastic pollution along Vancouver’s shoreline. 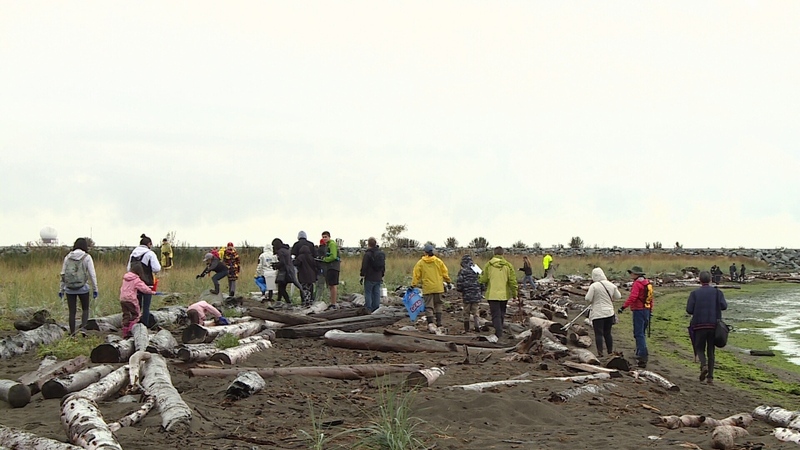 Despite the wet weather, participants flocked to Iona Beach Regional Park Saturday for the 25th annual Great Canadian Shoreline Cleanup. Amanda Demmer said it was important to support the cause and bring her young son to teach him how to be a responsible steward of the environment. “We go to the aquarium and it is nice to see the animals, but to be out in nature and see the birds, and see the impact the litter makes is a really important thing for him to see,” she said. In the event’s 25-year history, volunteers have picked up one-million kilograms of litter. The Great Canadian Shoreline CleanupIt reports single-use plastics, such as straws, bags, coffee lids and food packing, account for most of the trash. “It is not hard not to feel angry because you just feel how inconsiderate it is when people are throwing their garbage on the ground,” said Jen Rollins, another volunteer. Vancouver is the first Canadian city to ban plastic straws, polystyrene foam cups and take-out containers, which will come into effect next spring. The manager of the shoreline clean-up said such historic moves is a step in the right direction. “What’s been really encouraging is there’s been a lot of international focus on these single-use plastic items,” Kate Lesouef said. Besides helping out this weekend, Demmer tries to make a change in her everyday life to combat contributing to the plastic pollution. “I’ve tried to make a reduction in the household plastics use and to make smarter decisions when we are shopping. But it is incredible how it just ends up in places we never expect,” Demmer said. Saturday’s event coincides with International Coastal Cleanup Day. Volunteers descended upon Iona Beach Regional Park Saturday for the 25th annual Great Canadian Shoreline Cleanup.